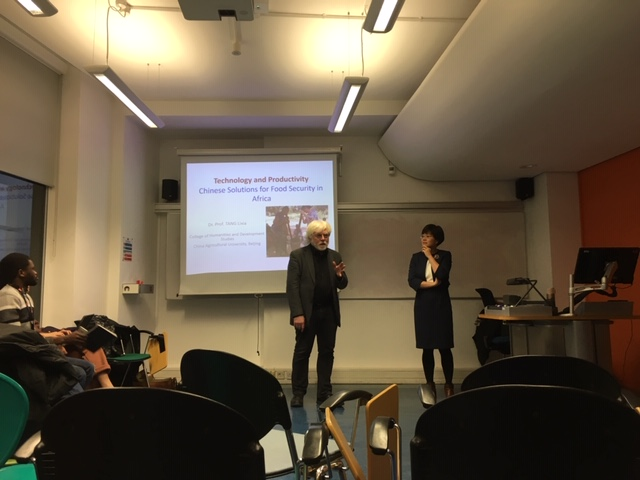 On Monday, 11 February, some of the students of the Department of International Development attended a seminar given by guest lecturer Professor Tang Lixia on the role of China in the agricultural sector in Africa. Read about the seminar here. In a 90-minute-long conversation, students were able to listen to Professor Tang Lixia’s presentation and ask burning questions on the very controversial topic about the emergence of China as a main player in Africa. Professor Tang Lixia highlighted that one of the most important priorities of China’s strategy in Sub-Saharan Africa is food security. This comes from a learning experience from China itself by having taken extensive measures on food security in order to domestically reduce poverty. Within the agricultural sector, Professor Tang Lixia discussed how China considers Sub-Saharan Africa to be rich rather than poor because of the extensive land and agricultural possibilities these countries have compared to the living conditions and access to food China had during the 1980s. Today there are mixed opinions about China’s involvement in Africa, but one important aspect that emerged from the seminar was that China aims at teaching new technologies and improving local agricultural production by transferring knowledge to the agricultural sector. One success story is Uganda during the 1970s: China taught Ugandan farmers how to use plant paddy rise instead of using traditional methods to produce rice. Still today, these farmers continue to use this practice allowing them to produce more rice. But there are many other stories that are not as successful. One of the main reasons is that often, even if you teach new technologies, it does not mean that local farmers will learn them and start adopting them; for instance, if local farmers have always grown sugar in a specific way it is very difficult to change their practices and norms. Think about when someone tells you that you should add different ingredients in a cooking dish that you love making; you probably will be interested but then you will stick to the old recipe because you know you like it and that it is good. One of the biggest criticisms of China’s involvement in Africa, which has also been highlighted by one student, is the fact that China aims at extracting natural resources rather than promoting poverty alleviation. Professor Tang Lixia explained that China’s vision focuses on promoting economic growth because that is what has worked at home. This means the priority is given to constructing infrastructure and technology because that is what has allowed China to grow so rapidly. However, because of the strong international pressure, China is now doing more investments in the health, education and other sectors. Finally, China is also strongly promoting its partnerships between universities in China and around Sub-Saharan Africa. The idea is that in this way students and professors are able to learn from each other and about new cultures. Professor Tang Lixia has taught in several African countries and she often teaches African students, enabling them to better understand Chinese culture and gain new experiences. The role of China will continue to expand in the future and different opinions will continue to emerge. Will China be able to reduce poverty in Africa? Is China becoming an alternative form of help compared to traditional Western donors? These are all questions that are yet to be answered. About Tang Lixia: Dr. Dr. Professor Tang Lixia teaches at the China Agricultural University and over the years has done extensive work on the Chinese experience of alleviating poverty. For the last ten years she has researched China’s role in the Sub-Saharan African agricultural sector. She completed a PhD at Humboldt University in Berlin in Agricultural Economics and a second one at the China Agricultural University in International Development Studies. In the past years, she has done fieldwork in many African countries from Zimbabwe to Uganda to work with local farmers, teaching and observing different agricultural practices. On one of her trips, she went to Tanzania to share lessons learned from China with Tanzanian farmers (see the paper she co-authored here). Laura Bichisao is currently doing her MSc in Development Studies. She previously graduated from University of Surrey. Her research interests are the role of China in Africa, governance and post-colonial Africa.